A quick and easy way to dress up oatmeal! 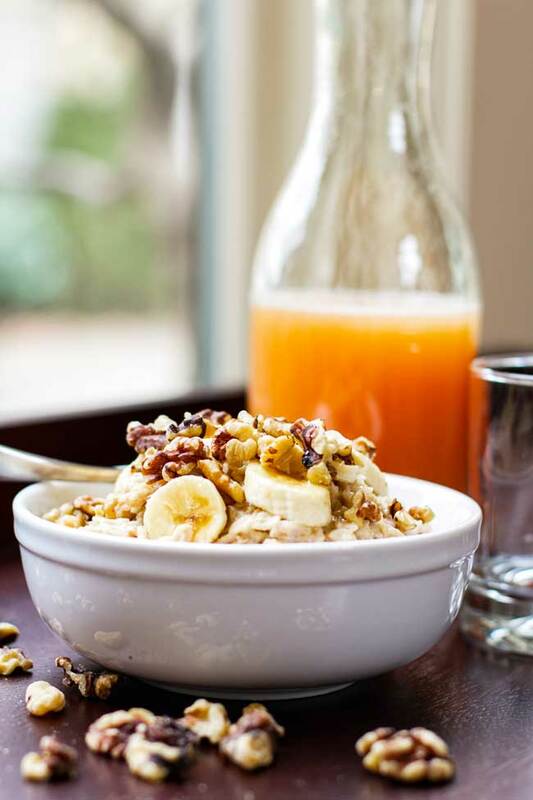 This banana nut oatmeal is a great way to start the day. I love breakfast on the weekends, but during the week? Not so much. As a notorious weekday breakfast-skipper I have tried in vain for years to establish a morning routine that includes a balanced breakfast, but always fail miserably. It’s not that I don’t have enough time or access to appropriate breakfast ingredients. 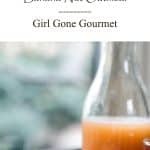 It’s certainly not due to a lack of creativeness in the breakfast recipe department – a quick look through the archives on this site is evidence of that. No, I’ve decided it’s one of two things: laziness or some kind of breakfast aversion disorder. I don’t like to think of myself as lazy so I’m going with the aversion one – this whole breakfast avoidance issue is definitely a clinical problem. This banana nut oatmeal I’m sharing with you today is something I enjoyed on a recent quiet Saturday, but maybe you’re a dedicated breakfast eater during the week? If so, then you’ll love this! It may look fancy and high-maintenance, but it takes very little time to toss together. Also, it’s very filling – oatmeal, walnuts, and bananas will get you to lunchtime feeling pretty good about life. No need to worry about that hangry I need to eat something NOW before I diiiieeeee craziness that tends to hit mid-morning on those days we skip breakfast. Which, for me, happens five days a week (I’m sorry co-workers). So, I’m going to research options for weekday breakfast therapy and in the meantime, I hope you give this a try. Whether you make it during the week or on the weekend it’s a happy way to start the day! A quick and easy oatmeal with bananas, walnuts, and a little maple syrup. It’s a great way to start the day! Peel and slice the banana in half. Mash one half of the banana with a fork until it’s broken down. Slice the other half into 1/4″ slices. Place the oats in a microwave safe bowl, add the water, and stir to combine. Cook the oats in the microwave for 1 minute. Add the mashed banana, maple syrup, and milk and stir to combine. 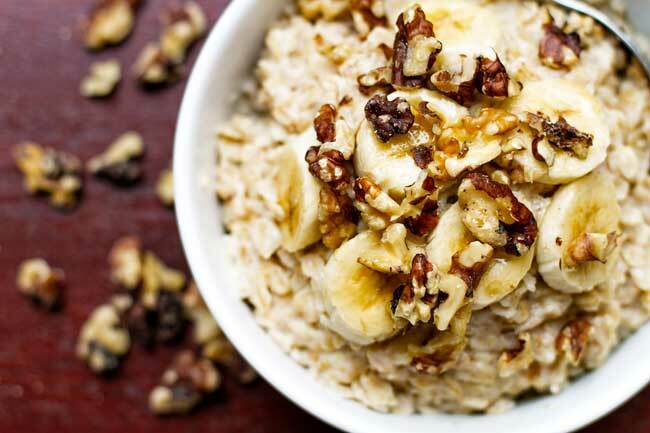 Top the oatmeal with the sliced bananas, walnuts, and sprinkle the nutmeg over the top. Hi April, ok you have convinced me to try oatmeal. Looks so good. I love oatmeal! This banana nut oatmeal looks amazing! I too am a serial breakfast skipper. It’s hard to fit in on weekdays!